We are happy to present you information about the resistance of our labels Transfer PET (mW) without printing (designed for the steam sterilization) that we examined in a process of "plasma sterilization." We are very pleased with the result and it is our great references. Labels in this chemical reaction were compared with a label that plasma sterilization has not undergone. Contrast and print quality samples stayed, as well as adhesive-preserved and most intact. Labels were placed in the chamber simultaneously with the charge in the plasma sterilizers types: STERRAD NX, STERRAD 100S and STRRAD 100NX. They went through the entire sterilization cycle, therefore, some repeatedly. 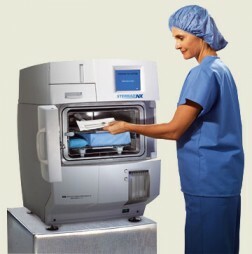 To better clearness we have to explain the process of plasma sterilization systems the STERRAD. Plasma sterilization runs at a low temperature in the chamber, which is under vacuum and with injected hydrogen peroxide. Diffusion in an electromagnetic field causes a plasma. This reaction releases free radicals which react with molecules of living matter (disrupting the protein lattice). Result is complete destruction any micro-organisms and pathogens. Labels which undergone this chemical reaction were compared with a label that plasma sterilization has not undergone and everything was 100% kept up. First of all, we have to thanks for cooperation in carrying out the test to Mr. Ing. Jiri Cermak. For more information and interest for these labels, please contact our EPRIN team sales department.